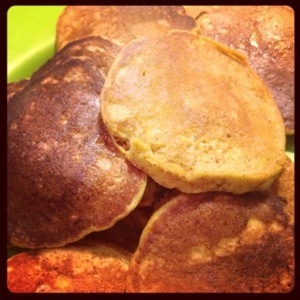 A truly yummy fall breakfast with a little less guilt. 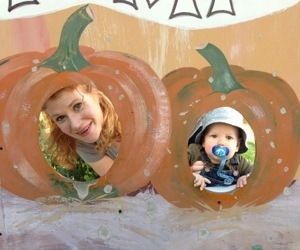 We went to a pumpkin farm a few weeks ago. If you live in the Chicago area, go to Kroll’s in Waukegan, IL. It’s a nice family run farm with a $7.00 corn maze, a short $3.00 educational hayrack ride and plenty of very reasonably priced pumpkins and gourds. No exotic animals, no admission fee and plenty of spots to take photos of the family! I roasted my pumpkins. You can used canned, but I like roasting my own. Preheat your oven to 350 degrees. 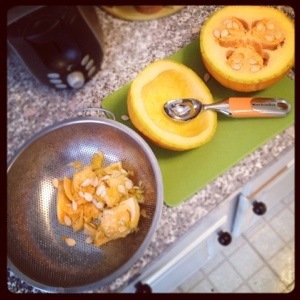 Cut your pumpkin in half, scoop out the seeds and place the cut pumpkin cut side down into a baking dish. Add about a 1/4 inch of water to the pan and roast for 40-60 minutes or into the pumpkin gives when you poke it. I like to scoop my pumpkin out with an ice cream scoop. It’s much quicker and easier than a spoon. When the pumpkin has cooled a bit, scoop out the flesh and mash or purée. Mix together dry ingredient in a bowl. Stir together wet ingredients in a small bowl, I actually do this in my 2 Cup measuring cup…why dirty another bowl. Gently stir the wet ingredients into the dry. Pour about a 1/4 cup at a time onto a preheated skillet over medium low heat. Cook for about 3 minutes per side. 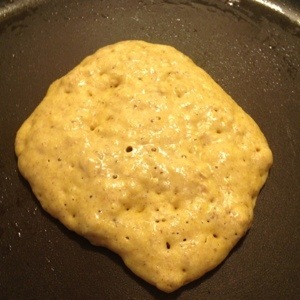 You can tell that the 1st side is done when bubbles for and pop in the center of the pancake. This recipe makes about a dozen 5 inch pancakes. Top with butter and maple syrup. Enjoy! For Squishy I leave the syrup off and cut the with a pizza cutter into bite size pieces. Pancakes are one thing I know he’ll eat, even when he’s cutting 1st year molars. It’s nice to be able to sneak in the whole grains and milk. Have a great weekend! 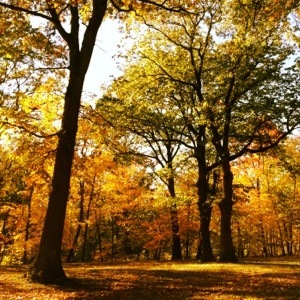 I hope you get a chance to get out and enjoy a bit of the fall colors.